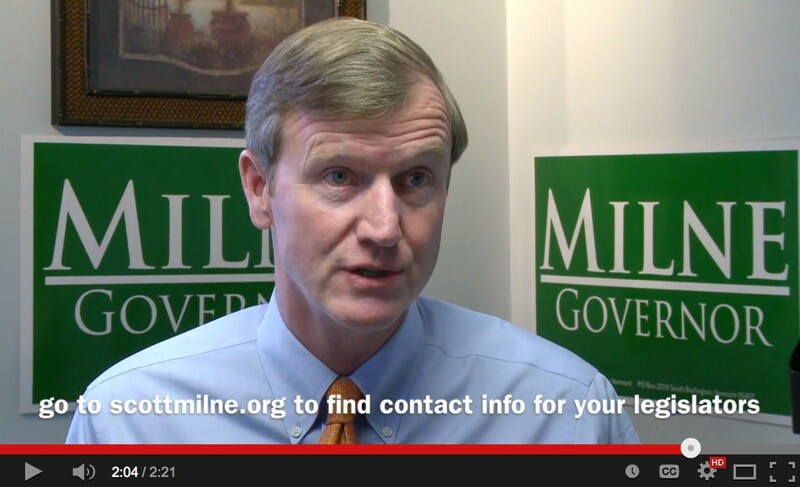 Scott Milne urges legislators to support his candidacy in latest web ad. Sen. Bill Doyle (R-Washington), the octogenarian Republican and political science professor, has changed his mind about his vote for governor in Thursday's election. Doyle says he’s heard from an unprecedented number of constituents who usually don’t speak up. “Normally I’d go for the top vote-getter," he says. "I’m going to vote for Washington County." Doyle says that means he’ll cast his ballot Thursday for Republican Scott Milne, the second-place finisher, instead of Democratic incumbent Peter Shumlin, as he had previously said he would do. Milne narrowly edged out Shumlin in Washington County. Doyle's change of heart is one among many indications that there is nothing ordinary about the vote legislators will take Thursday to decide who should be governor for the next two years. It comes after Milne declined to concede the November election, in which no candidate received a majority, as required by the state's constitution. Political ads, normally reserved for autumn, are airing in January. Election laws no longer prevail, though, so there is no requirement to reveal who is paying for the ads. Milne himself was preparing Tuesday to register as a lobbyist, as he has taken an election campaign into uncharted territory. Shumlin, who has said he’s not campaigning because the campaign is over, argues that democracy hinges upon electing the candidate who gets the most votes. The group Vermonters for Honest Government is airing $30,000 worth of ads on four Vermont TV stations, calling two-term incumbent Shumlin a failed leader. This week, the group is also making a heavy push on Facebook to highlight everything negative that’s ever been said about Shumlin. Bill Round, the Newport Center retiree who launched Vermonters for Honest Government, says he doesn’t know whether the ad has helped persuade any legislators, but he says it has generated a lot of discussion. Doyle says he doesn't attribute the surge of public sentiment in his district to the television ad, because the comments started before the ad appeared. As he enters his 47th year in the Senate, Doyle says he’s been surprised by the response. “I’m hearing from people I never knew before and have never spoken to me,” Doyle says. The Johnson State College professor had previously expressed concerns about electing a candidate who hadn’t received the most votes. Now, he appears to have been persuaded otherwise. Sen. John Rodgers (D-Essex/Orleans) is getting the same flood of comments but says he’s unswayed. He plans to vote for Shumlin, though the majority of voters in his districts backed Milne. Little is known about who is behind the ad imploring Vermonters to call on people like Rodgers and Doyle to vote for Milne. Though the group’s ad calls for more transparency in government, Round declined to reveal who has contributed money to pay for it. Round, a retired Navy captain and Boeing project manager who grew up in Vermont, is the only one who’s attached his name to the cause. So how can Vermonters know whether ordinary voters are funding the defeat-Shumlin ads or whether it’s coming from outside interests? Round is following the law, if not his own call for greater transparency. He is not required to reveal who his contributors are, even though such groups must do so during elections, according to the attorney general’s office. That’s because Thursday’s vote by the legislature is not an “election” as defined by state campaign finance laws, says Assistant Attorney General Michael Duane. Round and his group are not campaigning for a candidate; they are lobbying the legislature, Duane said. Duane says his research brought him to the conclusion that Vermont’s campaign finance laws govern elections where the general populace goes to the polls. In November, the Vermont populace went to the polls and failed, by the standards set in the state Constitution, to elect a governor because no candidate received more than 50 percent of the vote. The Constitution says that when that happens, the legislature decides who is governor. There’s nothing in the state's campaign finance laws addressing a legislative vote, he said. So when he surfaced last week to advocate for Milne, Round was advised to register as a lobbyist rather than as a political action committee, which he did. There’s little real-life difference, except lobbyists don’t have to detail their fundraising as PACs do. If Milne spends more than $500 on this post-election election, he too will need to register as a lobbyist, Duane says. Milne said Tuesday he was approaching that spending mark and was looking into registering as a lobbyist. While the state doesn’t consider Round’s ad a political campaign, a branch of the federal government does. The Federal Communications Commission requires TV stations to list the advertising airtime Round bought and post it on its website. Those filings show that Round paid four stations a total of $30,519 to run the ads for just over a week leading up to Thursday’s vote. Milne, meanwhile, has kept the same slow-paced, low-key campaign style he displayed during the election season. He says he’s not calling legislators to ask for their vote but sees it as their job to call him. On the Mark Johnson Show on Tuesday, he said not many were. He was planning to circulate in the Statehouse on Wednesday as legislators return for the first day of the session. With Round’s group airing its ad, Milne says he changed his own advertising plans, opting against spending $10,000 on TV time this week. Instead, Milne is buying Facebook ads he characterized as less than $500 worth and put together a $160 online video making his case to Vermonters. In the two-and-a-half-minute ad, Milne makes a ponderous pitch. He offers no specific statements about what he would do as governor but says he would get the economy back on track and better manage the people’s money, “so that we’re not sort of on some sort of trail toward becoming some version of Detroit." As far as what impact the debate is having on legislators who will vote Thursday, there are nearly as many rationales as there are lawmakers. Some say they will vote as the people in their districts voted. Others will vote for person who won the most votes. Others for the person they think will be the best governor. Some are mad at Shumlin and won’t vote for him as a result. Others who are equally furious at him, say they'll vote for him anyway. Rep. Tim Jerman, (D- Essex Junction) says he’ll vote for Shumlin. "The popular vote winner should be elected. If Scott Milne had won by one vote I'd vote for him."